A cOMPOSITE PHOTO OF ZELIE GUERIN AND LOUIS MARTIN NEAR THE TIME OF THEIR MARRIAGE, COURTESY OF FR. ANTONIO SANGALLI, O.C.D. st. leonard's bridge over the sarthe river, alencon. photo courtesy of the shrine at alencon. The lacemaker, Zelie Guerin, and the watchmaker, Louis Martin, first saw each other while crossing the St. Leonard Bridge over the Sarthe River in Alencon. Zelie heard an interior voice, which she understood to be that of the Blessed Virgin, saying "This is the one I have prepared for you." The two young artisans were introduced, probably by Louis's mother, who attended a lacemaking class with Zelie. ZELIE MARTIN'S ENGAGEMENT RING AND WEDDING RING. PHOTO COURTESY OF SUSAN EHLERT. Although they married three months after they met, it is known that their engagement was sealed by the Church in a religious betrothal ceremony. Like all couples who chose to be married in the Catholic Church in France at that time, Louis and Zelie were obliged first to undergo a civil marriage ceremony in the town hall; the Republic did not recognize church marriages. The civil proceedings began on June 24, when Louis and Zelie appeared before Maitre Felix Homney, a notary, and declared their intention to marry. Zelie was living with her parents at rue Saint-Blaise, which had been her girlhood home since her parents moved to Alencon when she was about twelve. RUE SAINT-BLAISE, WHERE ZELIE GUERIN LIVED AS A GIRL. ON HER MARRIAGE SHE LEFT THIS HOUSE, BUT SHE RETURNED TO IT IN 1871 WITH HER HUSBAND AND CHILDREN. We can imagine her preparing for the ceremonies and getting dressed here. 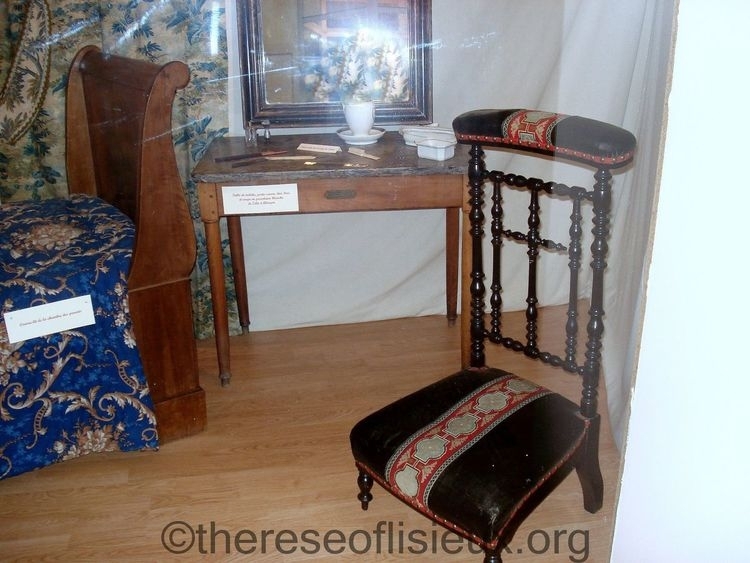 Zelie's dressing table and prie-Dieu. Photo courtesy of Susan Ehlert. Zelie's dressing table. Photo courtesy of Susan Ehlert. Zelie's jewelry. Photo courtesy of Susan Ehlert. 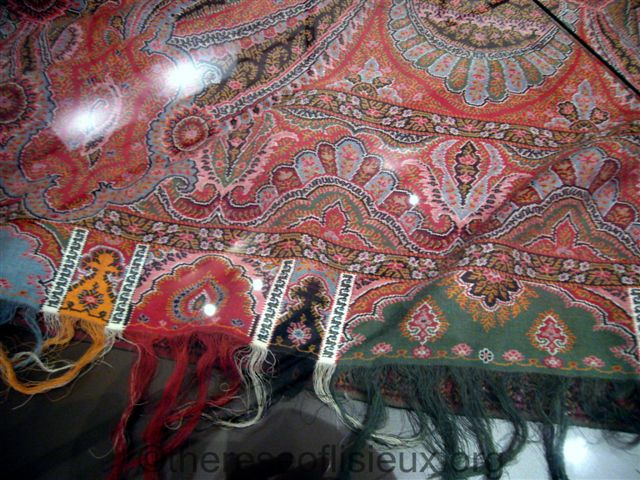 An embroidery made from Zelie's hair, after the fashion of the time. Photo courtesy of Susan Ehlert. Zelie's shawl. Photo courtesy of Susan Ehlert. the church of notre dame of the assumption in alencon. in 2009, after the beatification of louis and zelie, it was named a basilica. At midnight, with the beginning of Tuesday, July 13, they went to Zelie's parish church, Notre Dame, for their religious ceremony. They had a quiet, reverent wedding by candlelight, surrounded by their closest relatives and a few friends. WHY DID LOUIS AND ZELIE MARTIN GET MARRIED AT MIDNIGHT? Couples who preferred a quiet, prayerful ceremony in the intimacy of the Church, without a lot of show, often scheduled their weddings for midnight, especially on a weekday. Since the Eucharistic fast then began at midnight, a midnight wedding allowed those who wished to receive Communion to do so. Louis and Zelie also wanted to have time, later on their wedding day, to take the train to Le Mans to visit Zelie's sister, Marie-Louise, who had entered the monastery of the Visitation there three months before. The main altar of the church of our lady of the assumption in alencon. note the small chapel behind the main altar, separated from the rest of the church by a curtain. an oral tradition suggests that the marriage of louis and zelie martin took place in that chapel. EXACTLY WHERE DID THE CHURCH CEREMONY TAKE PLACE? Who was the presiding priest? m. frederic hurel,the priest who presided at the marriage of louis and zelie martin. photo courtesy of peter and liane klostermann, with thanks to the shrine at lisieux. M. Frederic Hurel, who, in Louis's boyhood, had been a cure at St. Pierre de Monsort (Louis's parish church, and the church where he and Zelie worshiped until they moved to rue Saint-Blaise in 1871) witnessed the marriage. In 1858 he was dean (senior priest) of St. Leonard's Church. He was a leading figure in the Catholic Circle at Alencon, a group of energetic young Catholics who supported each other in the faith and in social action. Louis Martin was an active member of this circle, which was named for his close friend, Vital Romet. How was Zelie dressed for her marriage? Vestment made from zelie's wedding dress (information furnished by the shrine at alencon). therese painted on it this design representing the martin family. The two roses at the base represent Louis and Zelie. The five opened lilies surrounding the Holy Face of Jesus symbolize the five Martin daughters who grew up. Therese probably identified herself with the lily that is half-hidden behind the Holy Face. The four unopened buds represent the two sons and two daughters whom Louis and Zelie lost at very young ages. This re-use of the precious fabric of wedding dresses for vestments was not unusual in the family. Jeanne Guerin's wedding dress was given to the Carmel to make curtains for the little communion grille. Later the bridal dress Therese wore for her Clothing was sacrificed to decorate priestly vestments for her canonization Mass. WHAT DID THE CEREMONY LOOK LIKE? TABLEAU REPRESENTING THE MIDNIGHT WEDDING OF LOUIS AND ZELIE MARTIN. 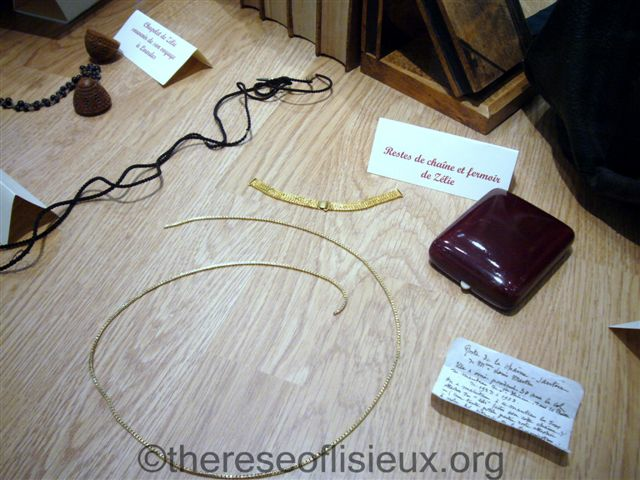 PART OF AN EXHIBIT IN HONOR OF THEIR BEATIFICATION AT LISIEUX, 2008. photo courtesy of susan ehlert. The above tableau suggests how the wedding ceremony could have appeared. WHAT WAS THE "MARRIAGE MEDALLION?" At some weddings in France then, it was customary to use a "marriage medallion" which the priest blessed. Louis, the jeweler, designed the marriage medallion himself as a gift to Zelie, using the Biblical story of Sarah and Tobias as his theme. LOUIS AND ZELIE'S ORIGINAL MARRIAGE MEDALLION, NOW IN THE CUSTODY OF THE DIOCESE OF SEES. PHOTO COURTESY OF SUSAN EHLERT. At the moment they exchanged their vows, the priest blessed the medallion. Louis slipped the wedding ring on the finger of Zelie's right hand, and then placed the medallion in her left hand, saying "Receive the symbol of our wedding promises." Front side of the marriage medallion of Louis and Zelie Martin, representing the Biblical story of Sarah and Tobias. Photo courtesy of Fr. Antonio Sangalli, O.C.D. What was the date of Louis and Zelie Martin's wedding? The date is sometimes given as July 12 (their feast day), sometimes as July 13. In fact, since the ceremony did not begin until midnight, they were married on July 13, 1858. What was Zelie's baptismal name? 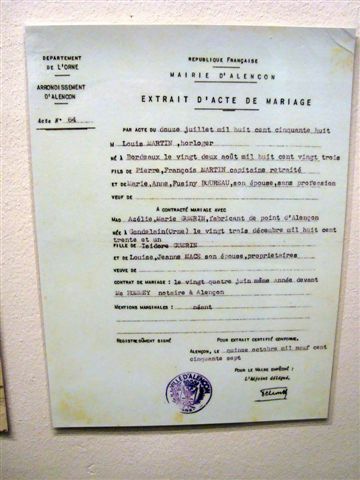 the certificate attesting to the religious marriage ceremony of zelie guerin and louis martin. Zelie was baptized "Azelie-Marie," and her baptismal certificate gives these names. She was always called "Zelie" and signed her letters "Z. Martin." Unfortunately, especially since the canonization, her name is often listed as "Marie Zelie" or "Marie-Azelie." Both the contemporaneous documents and the vice-postulator, Father Antonio Sangalli, confirm that this is an error. After the marriage ceremony Fr. Hurel completed the marriage certificate. He notes that the pastor had given him permission to preside at the marriage; that the banns had been read; and that Louis and Zelie had celebrated a religious engagement ceremony. Louis and Zelie were, of course, the first to sign the certificate. Note that Zelie omitted her second name; she signed only “Azelie Guerin" (see the lower right). Then their relatives and friends signed as witnesses. WHERE DID LOUIS AND ZELIE BEGIN THEIR MARRIED LIFE? THE ORIGINAL BUILDING ON RUE PONT-NEUF WHERE LOUIS MARTIN MAINTAINED HIS WATCH SHOP. HE LIVED OER THE SHOP WITH HIS PARENTS AND HIS YOUNG NEPHEW. ZELIE JOINED HIM HERE WHEN THEY MARRIED. This building on rue Pont-Neuf, where Louis had lived with his parents and his nephew for some years, saw the beginning of their marriage. Zelie moved into the household, and Louis and Zelie lived here from 1858 until 1871: for 13 years of their 19-year marriage. All their children were born here except Therese. I hope that the Church will acquire and preserve this property. Although it's less well known than the house on rue Saint-Blaise, it is of vital significance in the story of this family's holiness. These upper rooms, the Martin family's home, were the scene of Louis and Zelie's wedding night, which was both eventful and uneventful. But that is another story. *Louis et Zelie Martin, by Thierry Henault-Morel. Paris: Editions du Cerf, p. 78. I am indebted to this superb book for several details.